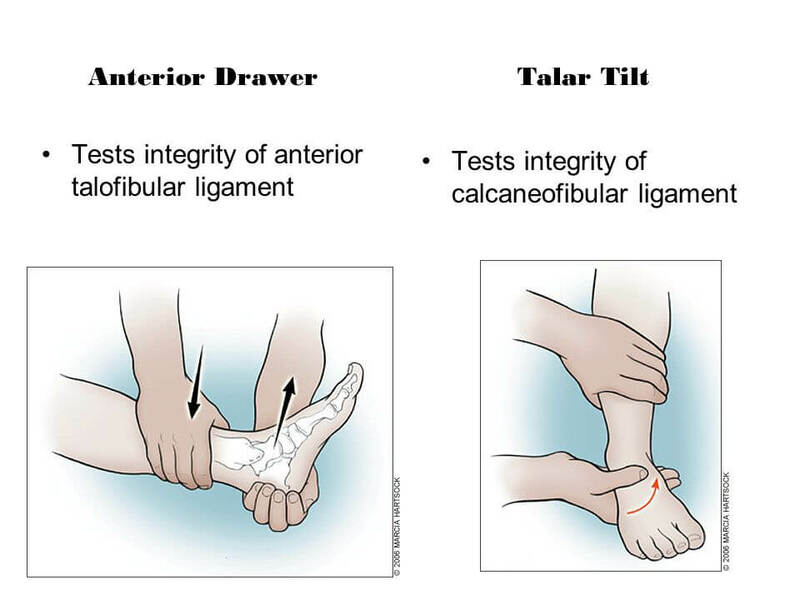 Assesses: the stability of the anterior talofibular ligament (ATFL). The examiner exerts a downward force on the tibia while simultaneously attempting to “lift up” the foot while grasping behind the heel. A significant difference from the unaffected side (>2 mm) or dimpling of the anterior skin (suction sign) is considered positive. The examiner grasps the patient’s leg midway up the calf and performs a compress and release motion. A positive test is considered if the patient experiences pain in the area of the syndesmosis. The examiner squeezes the calf with the patient prone. If the foot does not plantar flex, the test is positive for Achilles tendon disruption.